The square shape of this under mount sink complements a range of decor styles, from classic to contemporary. The naturally hygienic, non-porous surface is coated with a premium baked-on glaze, for an easy-to-clean high-gloss finish. This model is ideal for retrofitting, with a drain opening designed for standard US plumbing connections. Pair this sink with a Kraus center set or widespread faucet for a beautifully coordinated bathroom. The new series of bathroom sinks from Kraus offers a fresh take on classic white ceramic. The rectangular shape of this undermount basin complements a range of dicor styles, from traditional to contemporary. The smooth, non-porous surface is naturally hygienic and durable, with a premium baked-on glaze for an easy-to-clean high-gloss finish. This model is ideal for retrofitting, with a 1 3/4" drain opening designed for standard US plumbing connections. Pair this sink with a Kraus centreset or widespread faucet for a beautifully coordinated bathroom. Freud 19 1/4-inch Undermount Handmade Pure Solid Copper Bathroom Sink with Overflow Meet the Freud copper sink from Sinkology. This copper sink is artfully handcrafted from pure solid copper. Featuring specialized undermount design and standard front overflow system, installation is hassle free on this copper sinks. This true work of art comes with a limited lifetime warranty and is easy to clean and maintain, simply wash with soap and water. 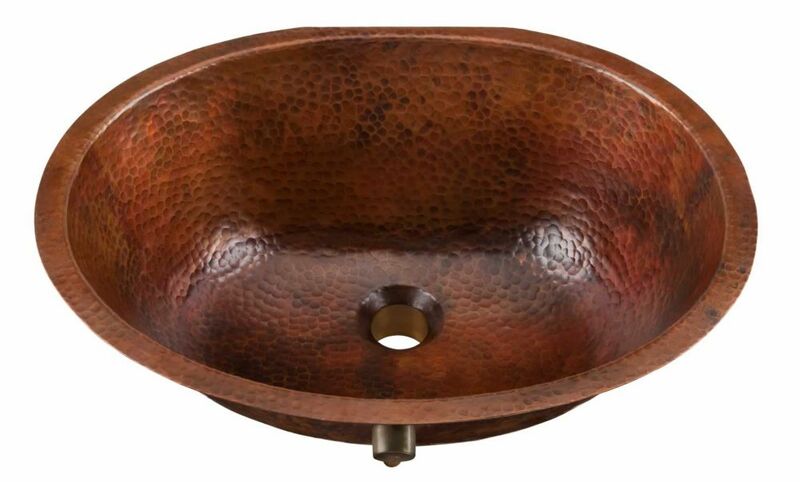 Freud 19 1/4-inch Undermount Handmade Pure Solid Copper Bathroom Sink with Overflow is rated 3.4 out of 5 by 7. Rated 3 out of 5 by Michael from The sink wouldn't fit in the space. So it was... The sink wouldn't fit in the space. So it was returned. Check your available space before you order! Also the drain with a overflow you will need a pop-up system type drain. Rated 5 out of 5 by Beahbeardad from I am in process of a major bath renovation and... I am in process of a major bath renovation and saw this sink at a REALLY great price and couldn't resist. I can't attest to its wear, use or longevity since it is not installed yet and plan on switching out the standard white bowl that came with the granite vanity we also purchased at HD. Looks wise it is really a gorgeous copper sink and look forward to it aging and getting darker with patina patterns. After all the beauty of copper is the unique coloration it will eventually get. It will require a bit more care and stay away from any bleach or scouring products to clean it but it will be worth the effort. Another big score from Home Depot! Rated 5 out of 5 by HomeDepotCustomer from Copper Sink This STUPID SURVEY IS A PAIN IN THE A@@! I liked my sink but your stupid survey keeps telling me i am missing something. What if i do not want to fill out every box. Make it easier. KISS Keep it Simple Stupid.